Yes, we wear shoes. A few of us even wear cleats. - Mississippi Believe It! Home » Resources » Campaign » Yes, we wear shoes. A few of us even wear cleats. Yes, we wear shoes. A few of us even wear cleats. Brett Favre – the only player ever to be named the NFL Most Valuable Player three years in a row and holds the record for the most wins of any NFL starting quarterback. Ray Guy – was the first punter ever selected in the first round of the NFL draft, and is the first punter ever elected for enshrinement into the Pro Football Hall of Fame. Archie Manning – set New Orleans Saints passing records, played in two Pro Bowls and was named the NFC Most Valuable Player in 1978. Eli Manning – led the New York Giants to a stunning win over the undefeated New England Patriots in Super Bowl XLII. Walter Payton – 25 years since he last took the field, “Sweetness” is still ranked among the NFL’s greatest, appearing in category after category of the NFL record books. Jerry Rice – the greatest receiver in NFL history, owns virtually every major career receiving record in league history. 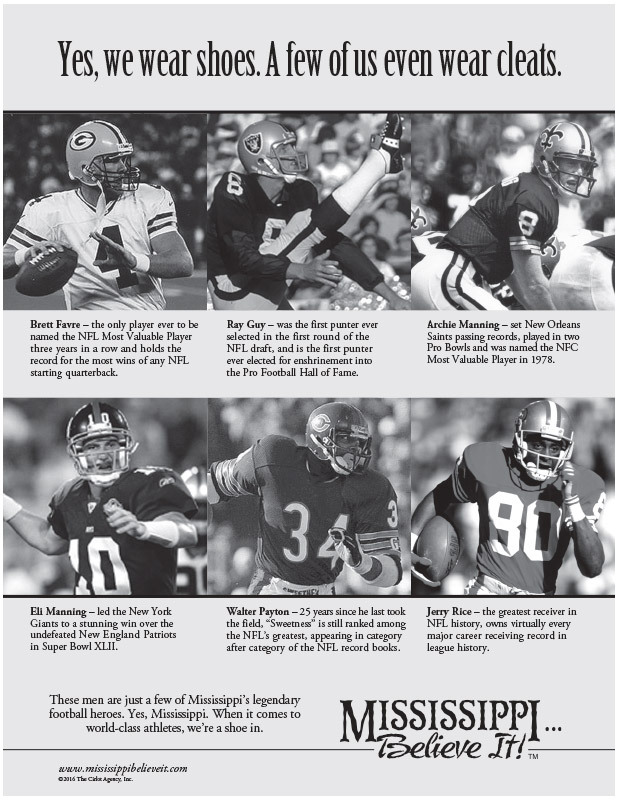 These men are just a few of Mississippi’s legendary football heroes. Yes, Mississippi. When it comes to world-class athletes, we’re a shoe in.